One of the ironies of running a travel business is that it often stops you from travelling when you want to. High season is from April to October – and this is exactly the time when I want to embark on a road trip through Europe. The idea has been going through my mind for several years. This summer is different though – this summer I am going to make my dream come true. I’m in Delft, Holland visiting my son for a couple of days. He is a student here. Then I’ll leave Delft and drive east to Germany and to the valley of the River Rhine. Delft is a delightful Dutch town, loads of canals, charming town houses, squares lined with cafes. It’s a great place to sit and relax, think big thoughts and plan a massive road trip. Five countries, ten days, 2000 kilometres and a scenic route wherever possible. That’s my plan. Around about 11.30am on a sunny Thursday morning I’m off, heading for the motorway that runs east through Holland, following sign posts for Arnheim and later Maastricht. The road is busy, loads of lorries, the sun beats down. I’m having to concentrate hard, traffic is very heavy and I’m feeling very anxious. I hadn’t anticipated feeling concern. But it is there lurking in the corner, just outside my field of vision. I drink half a bottle of water, turn on some music, try to calm myself. The GPS, which I dont really know how to work dangles listlessly from the glove compartment. I can’t work it and it would appear I can’t even attach it effectively to the dashboard. Never mind I don’t need it. I know where I’m going. I drive for about an hour, maybe two hours. I need to stop. I need to relax. I find some road-side services and pull in for a drink and to use the facilities. I need a euro to use the loos, I haven’t got a euro – back to the car, find a euro, back to the building, back to the loos. Such a drama for such a small thing. I have a coffee and buy lots of water. As I’m driving along I drink vast quantities of water. I mean vast quantities, probably a litre per hour. At some point I’ve crossed the border into Germany. I must have missed the sign – probably slurping from my water. I want to reach the River Rhine today and drive the scenic stretch from Boppard to Bingen. 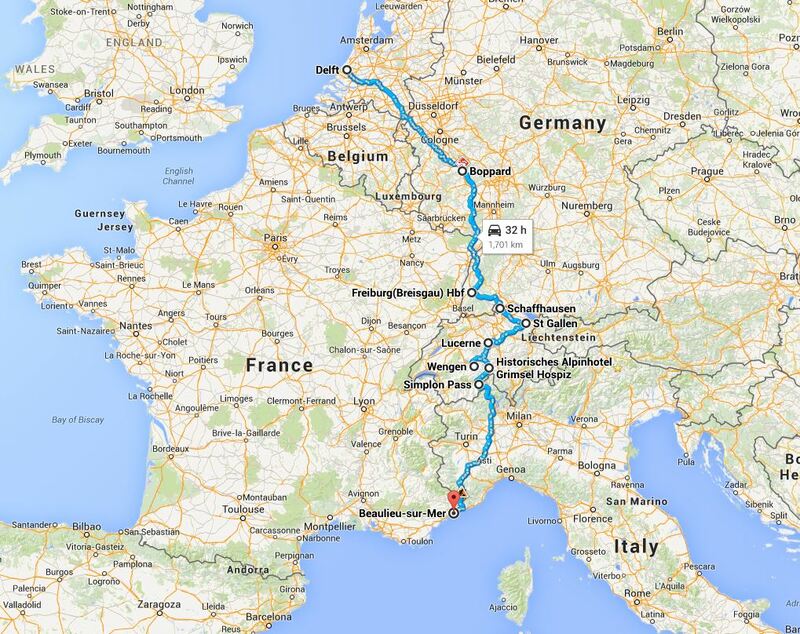 I calculate that it is probably 160 kms to the bit of the Rhine I want to see. I push on – determined to make my destination. By late afternoon I leave the motorway and find myself on a wonderful small road heading over the hills in an easterly direction. It isn’t long before I get my first glimpse of the mighty River Rhine. This river flows from the Swiss Alps to the North Sea at Rotterdam covering more than 1200 kms from source to sea. This river has witnessed wars, changes in borders, the move from river-based transport to highways. The river is an artery for travel and an important focus for agriculture and electricity generation. I stop and put the roof down on the car. I admire the river as it snakes lazily through the countryside. The slopes leading down to the river are covered in vines – I’m reminded that this is an important area for wine production in Germany. And despite the British snobbery that exists towards German wines, based on Liebfraumilch and Blue Nun in the 70s, in fact Germany produces many top class Rieslings. I drive through the quaint and attractive little town of Bingen and head out of town with the river on my left. The sun is getting low in the sky and the valley of the Rhine is broad and flat floored. The road is quiet, the drive is relaxing. Next challenge, where to stay for the night. Although I’ve run various travel companies for the last 25 years I’m actually quite disorganised when it comes to my own travel arrangements. I don’t like booking hotels in advance, I love just hitting the road and seeing what happens. This can go either way. Sometimes I end up in the most spectacular, fabulous places and sometimes I don’t……………you just never know. I proceeded through pretty villages, I spotted the Lorelei Rock- this is the point where the Rhine is at its narrowest. I admire the castles built at strategic points along the river. I start to think about somewhere to stop for the night. I finally settle on a small guest house with a little garden and a car park right outside. I bounced into the reception area to discover that the owner and his wife spoke no English whatsoever. This is a strange experience for me, I speak Italian and French, I can understand Spanish BUT I do not speak German. My hosts did not speak English. I really mean NO English, not a word. I managed to cobble together ‘ein zimmer bitte’ which I think means ‘ one room please’ and the elderly owner (remaining in his chair) handed me a key and indicated that I should go and look at the room. The room was fine, small, adequate, nice view of the river – and a bargain at Euros 40— for the night including fruhstuck (which means breakfast – I can read it I can’t say it). So I dumped my stuff and asked for ‘ein weiss wein bitte’ a glass of white wine please. Which I enjoyed sat on a broken deck chair in their front garden. The next order of business was something to eat. ‘Essen’ I asked hesitantly, they shook their heads and pointed up the road. 2 kms they said – using sign language. OK I said. Off I went. That evening I met Victoria Hassinger, a lovely German girl working as a waitress in her parent’s restaurant. Victoria spoke excellent English with an American accent. I was delighted to meet her. I learn that she is an only child and her devoted parents have spent every spare penny they have on educating her and sending her on every school trip going. Consequently she has been to London, Florence, Rome and Siena in Europe. She also spent a year in Oregon on a student exchange programme – hence the beautiful American-accented English. Victoria’s aim is to studying Ethnography at university – she’s hoping to get to Africa soon. Meanwhile she works in the family restaurant, in this pretty riverside town. I don’t think I’ve ever met a teenager who wants to study Ethnography before – I’m reminded of the fantastic Pitt Rivers Museum in Oxford. It’s an amazing collection of canoes, shields, spears, head dresses and costumes. One man’s take on ‘tribal groups’ in Africa in the Victorian era. Back in my little room at the B & B I settle down to sleep. I’m awoken almost immediately by a massive rumbling and roaring noise. I have no idea what it could be. I peer bleary eyed out of the window to see an enormous, high-speed train whistling and screeching its way through the valley. It hadn’t occured to me that the valley of the River Rhine, key transport link through Germany from north to south would have a train track running alongside the river. Doh – I can be such an idiot. The trains did seem to fade in my consciousness as the night progressed. The next morning I had breakfast at the table next to the B & B owners. It was a nice breakfast actually, ham, cheese, eggs, orange juice. As I didn’t know the vocab for any of these things I just had to point. They didnt seem to mind. I handed over my 40 euros and I was back in the car and on my way. 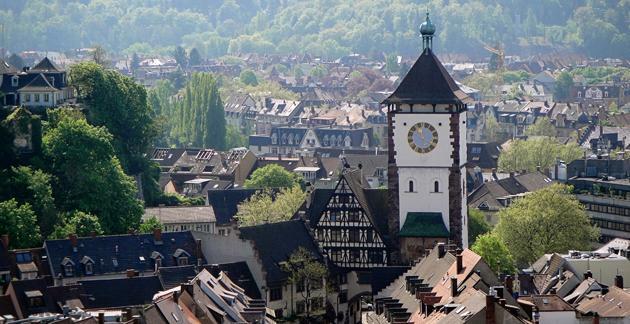 This time I’m en route for Freiburg, home to one of Germany’s oldest and most respected universities. Located in the heart of Germany’s Black Forest. The Black Forest inspired the brothers Grimm and looms wide and high in the folklore and fairy tales of Southern Germany. I’ve also got a nice surprise, my daughter is joining me for the evening. She’s spending a couple of weeks in a yurt in the Bavarian Alps – more of this later. For now it’s just a couple of hours easy driving to Freiburg. What could possibly go wrong…………..
With thanks to the Tourist Office, Freiburg – for the beautiful city images.